Serpukhovskiy Val Street links Serpukhovskaya Zastava Square with Shabolovka Street. 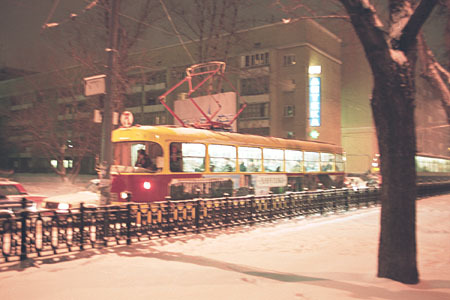 As the name of the street (having Val in it) tells, it once was a part of the former rampart encircling Moscow, being the next one after Danilovskiy Val to the west. Tram service was begun in this street in 1931 and remains heavy to date. In the last years, a motorcar traffic has also grown too heavy causing regular jams in the evening and morning rush hours. Serpukhovskiy Val Street begins here, at Serpukhovskaya Zastava Square. 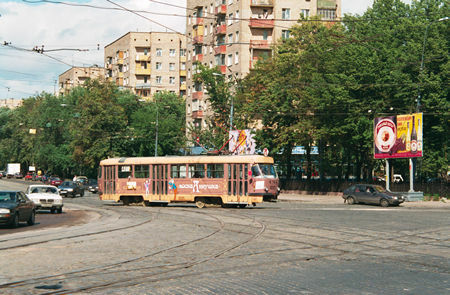 The boulevard is rather wide, with tram tracks on both sides; and the tracks are used by various types of trams - as, for instance, this vehicle which is the only model 71-621 tram ever built (this type never came to serial production, only this prototype had been manufactured). The square itself is a brilliant example of the stupidest traffic implementation I have ever seen. 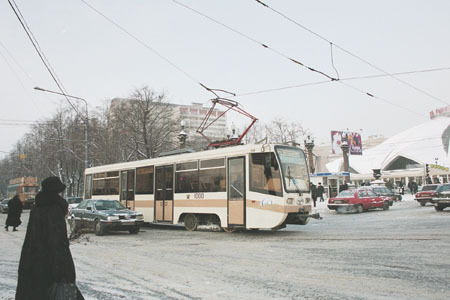 Most traffic currents here have to cross each other in various parts of this not so broad square, not excluding trams. Happily, there are not too many vehicles in the square on this photo - most decent people are already at home preparing for the New Year celebration. 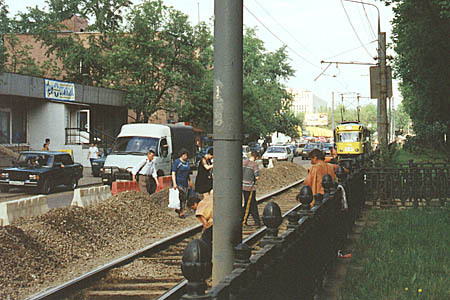 Track reconstruction in Serpukhovskiy Val was conducted without interruption of regular tram traffic. However, the motorists as usual were rather discontented because this overcongested street got even more narrow during the works. 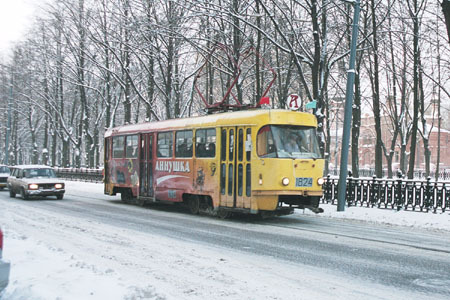 The line in Serpukhovskiy Val today is a part of the route A (Annushka). But it must be noted that vehicles of this route never run here during many decades until the closure of a reversing loop in Zatsepa Square. Annushka again, now at Khavskaya Ulitsa stop heading to Serpukhovskaya Zastava. 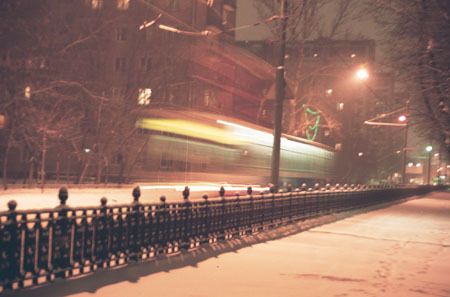 Serpukhovskiy Val at a winter night. Who says that trams are slow? Look how she flies :-). A crossing of Shabolovka and Serpuhovskiy Val has a rather complex track configuration, perhaps the most complex in Moscow (but far less complex than tram nodes of Vienna). 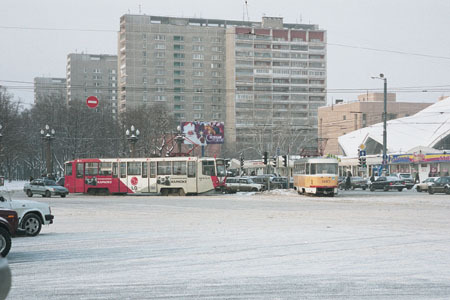 This junction is made up of two crossing lines, the first one from Shabolovka Street towards Tchertanovo, and the second one from Serpukhovskiy Val to Ordzhonikidze Street, with numerous connecting branches between them.